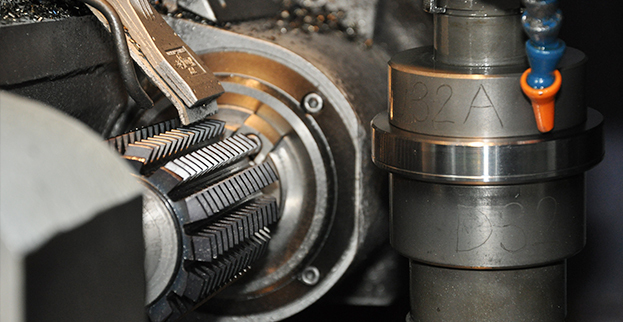 Tooth-flank-ground gears are gears manufactured more precisely and fast to meet the need for gears that are higher strength, lower vibration, and lower noise that our technology focuses on. Gear grinding is the method by which distortions occurring as from carburization can be removed with high efficiency and precision. This process improves the roughness of the tooth plane and the precision of the gears, as well as raising dimensional accuracy, making silent operation possible even at high speeds, resulting in dramatic gains in the precision of parts companies manufacture. 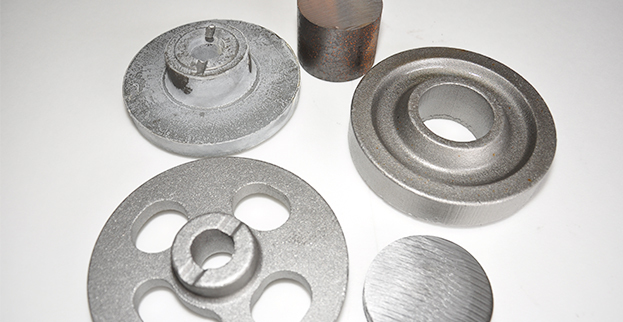 We have the materials in the form of forgings or round bars to offer gears that conform to specifications. The properties of the materials vary according to application and quenching process, but we commonly use SCM415, S45C, and similar steels. Blanks for the gears customers require are machined. This step directly affects the ones that come after it; so proper attention to dimensional accuracy and shape accuracy is vital. 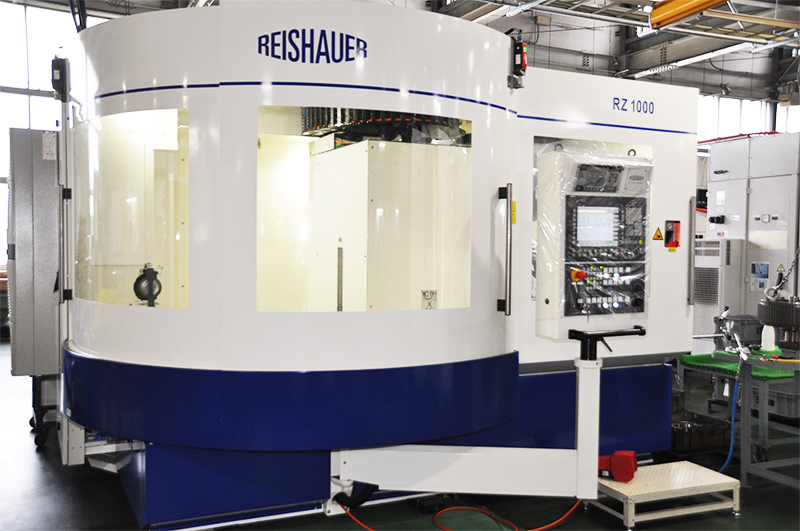 Machining centers are CNC machine tools that have the ability to bring many kinds of tools to a working position automatically, and serve various functions such as drilling and tapping without changing the work setting. 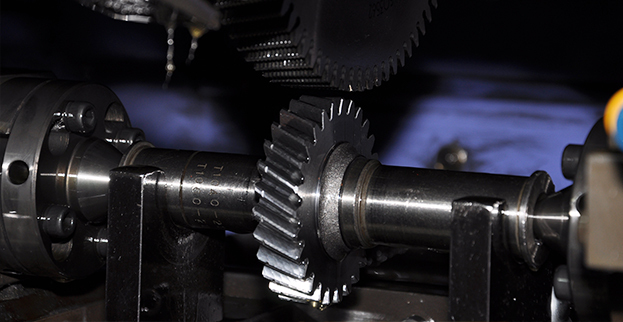 The typical gear is initially formed using a hobbing machine. 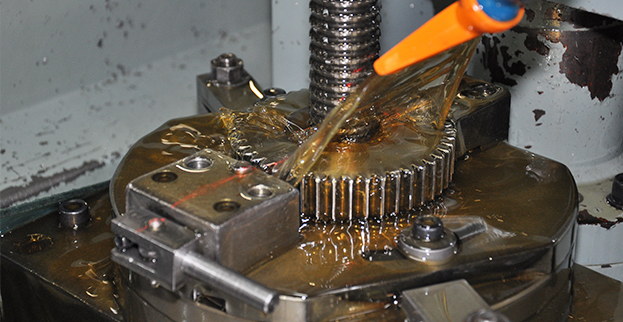 A hob is a tool for creating gear teeth by spinning a screw-like rack. The workpiece is mounted on a vertical shaft and cut. The hob’s teeth are designed in a spiral form; when the hob is of a single-thread type and it revolves once, the workpiece advances just one tooth. 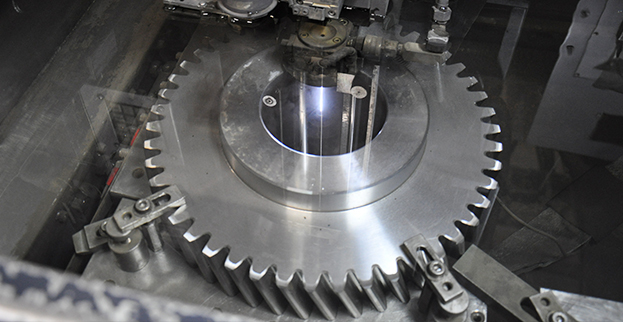 The workpiece proceeds gradually up or down, completing the gear cutting. 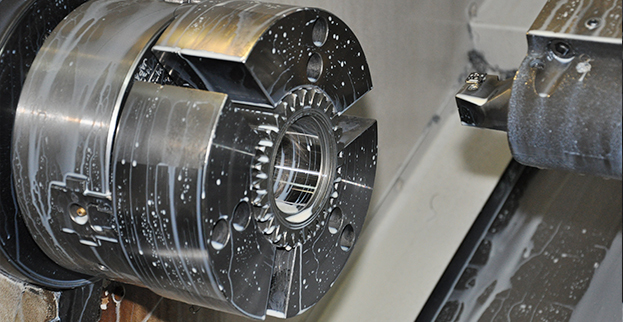 When machines are used for cutting, pointed parts like burrs can emerge. Chamfering is the process of removing these. It aims to prevent burrs from falling off during operation, rounding corners for safe handling and prevention of dents. 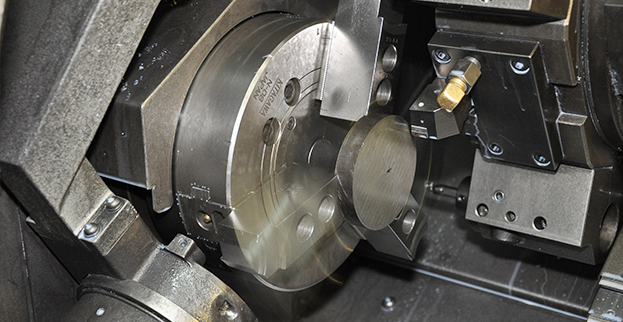 This is the process of cutting to precision in the micron unit. 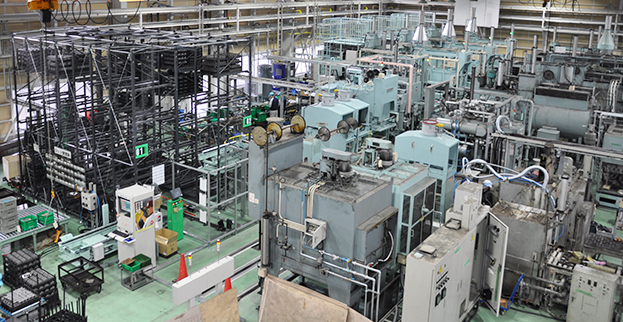 It is used in the finishing of gears for farm machines, for example. 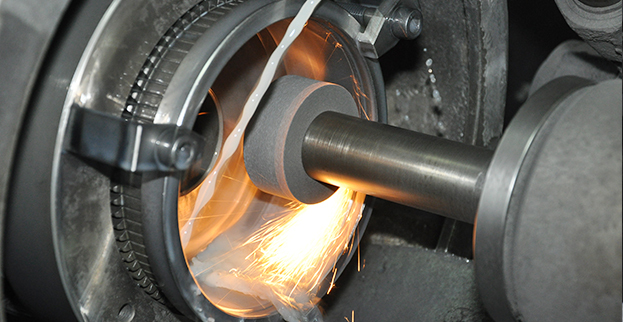 Regrinding of the cutting tools that we use is performed in-house. In this process, the workpiece of highly workable low-carbon alloy out of machining has carbon added to its outer layer, and the carburized outer layer only is hardened by quenching, or casehardened. Methanol drips in the furnace, and heat treatment occurs in its decomposition gas. Here the workpiece is machined using electrical discharge generated between the workpiece and a running wire electrode. 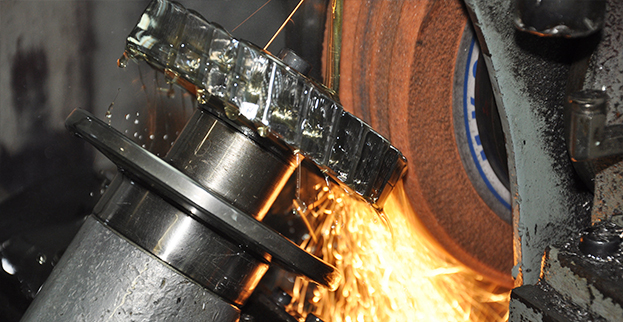 After quenching, a grinding wheel is used for internal diameter grinding, external diameter grinding, or surface grinding. 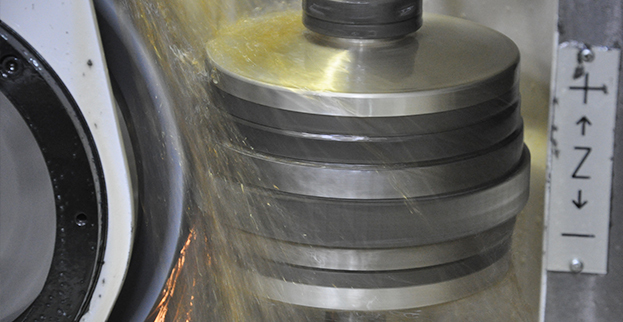 After quenching, with the surfaces’ hardness increased, a specialized precision turning machine is used to finish the planes, including inside and outside. Tooth-flank-ground gears are gears manufactured more precisely and fast to meet the need for gears that are higher strength, lower vibration, and lower noise. Gear grinding is the method by which distortions occurring as from carburization can be removed with high efficiency and precision. 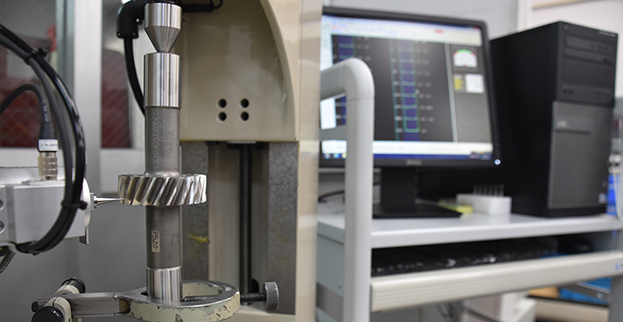 This process improves the roughness of the tooth plane and the precision of the gears, as well as raising dimensional accuracy, making silent operation possible even at high speeds, resulting in dramatic gains in the precision of parts companies manufacture. 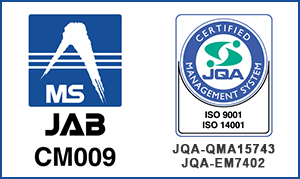 In order to supply products of the very quality, we also pursue the best precision in measurement and inspection.